"Highlight your research with SelectedWorks"
SelectedWorks can help you organize your research, follow your colleagues, build your tenure portfolio and archive your work to a safe space. You can manage your own uploads, or the Library can do it for you. If you'd like to know more, email digitalcommons@longwood.edu. 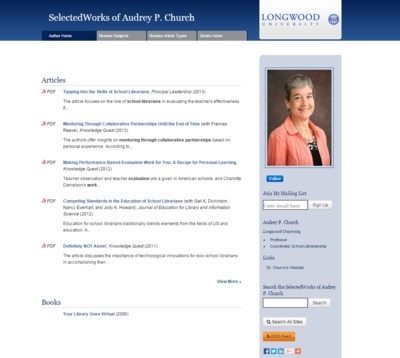 For an example SelectedWorks page, visit Dr. Audrey Church's SelectedWorks.